This beautiful book is essentially a larger scale Murder on the Orient Express* with a combination Every Day*/Groundhog Day* twist. I LOVED IT. This book is a masterpiece. Unfortunately for me, I didn’t have any idea what this book was going to be, so I was immediately put off by the realization that there was a male narrator (who was clearly not Evelyn Hardcastle). I had somehow thought that Evelyn was narrating and I don’t even know what. But as soon as I figured out what was going on (well, as much as the author allows), I was completely sucked in. All of the characters in this book were fantastically developed and interesting. No one, I repeat no one, is innocent in this book. Everyone has some kind of dark secret or past, and it is really impossible to know who to trust. The main character doesn’t even know what to make of himself, let alone the people around him. He is in a different body (as a different person) every day, so as he progresses through the book (and his time limit), his “hosts” become stronger and stronger and it becomes more and more difficult for him to focus on his mission. It’s nearly impossible to stay true to yourself and your morals/personality without actually knowing who you are (or anything about yourself), so naturally, that’s what he’s tasked with. OH MY GOODNESS the plot is so good. The author clearly worked out the timeline of this book many, many times to make it perfect, and it shows. The timeline makes sense. Even though there’s a Miss Peregrine type of loop, I was able to follow what was happening, and he kept everything that was supposed to be understood quite simple. There is so much happening in this book that it’s hard to even talk about, but it’s extremely well woven, and all of the backstory/past that is uncovered later on in the book ties in perfectly with the current timeline, and is kept separate in the best way. Okay! Can we mention! I am so ridiculously pleased with how he wrapped up this story. I enjoyed the adventure as it was happening, but I was concerned that there wouldn’t be a real/good explanation for why all of this was happening and whether this was real, what the outside world was like, etc. Thankfully (amazingly) this was not the case, and when the circumstances were explained, it seemed natural, and it didn’t lose any of its magic. Overall, I just really enjoyed this, and I highly highly recommend that you pick it up in September (or if you live outside of the US, maybe even sooner!). I will say, some of the darker parts of the story were quite dark (just how I like them), so just be aware that this is definitely an adult book. Other than some gory descriptions/topics, there’s really nothing to worry about with this book. I adored everything about it, and I just really hope it gets picked up and adapted to a movie. It would be incredible to see this play out on the big screen, and I can’t wait to see where Stuart Turton’s writing goes from here. Let me know if any of you have read this or plan to pick it up when it’s released! I’d love to hear your thoughts and just discuss what you thought of it. 🙂 If not- what’s the last five star book you read and why? Shoot me a comment down below; I’d love to hear from you guys! *disclaimer: links marked with an asterisk are affiliate links. If you use them, I will receive a small commission at no additional cost to you. My writing partner read it and told me all about it. ♥️ You are right about it making a great movie! That’s awesome! It’s popular enough that it could definitely happen. Fingers crossed! I was confused with our male protagonist too! Such a mind warp this book was! I completely agree! Did you enjoy it though? After I became more adjusted to the style, I really got into the story. I haven’t read this one yet, but now it is definitely on my TBR! I love the Murder on the Orient Express, but I don’t really read many mysteries because they can get repetitive. 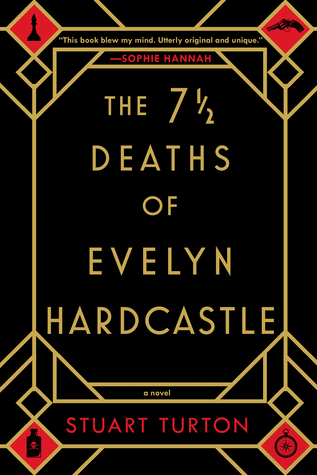 However, The 7 1/2 Deaths of Evelyn Hardcastle seems really unique and the body-swapping sets it apart! Thanks for the great review! I’m so glad! Definitely let me know what you think when you pick it up. I was totally taken by surprise and it was an awesome experience. I really want to pick up Agatha Christie’s books now! I’ve only seen the one movie, but I really hope I love them! Thanks for the lovely comment!